Pears: Combine sugar, water, and vanilla bean in a pan and simmer for 10–15 minutes. Add apple juice and vinegar and simmer for 5 more minutes. Place pears in a baking dish and cover with syrup. Cover the dish with foil and bake at 275°F for 1 hour or until tender, basting with syrup about halfway through the process. Remove from oven and cool; slice to desired thickness. Syrup may be refrigerated and reused. Vinaigrette: Combine all ingredients except oil in a blender. Turn blender on low speed and slowly drizzle in the oil to emulsify. Once the dressing is thick, add salt and pepper to taste. Put dressing in a pourable container and chill. Salad: Combine arugula, endive, and bleu cheese in salad bowl. Season with salt and cracked black pepper and add desired amount of vinaigrette. Toss lightly with the pears. 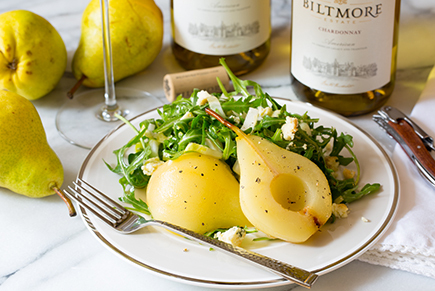 For added sweetness, drizzle some of the roasted pear syrup on the salad and serve.